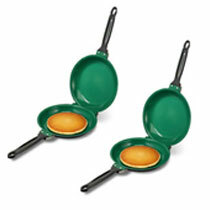 The Flip Jack is an all new pancake flipping pan from Orgreenic Kitchenware. It features the same ceramic non-stick and non-toxic coating as other Ogreenic cookware products. The special non-stick Orgreenic ceramic coating requires very little to no oils or butter to cook. So this means you can use the Flip Jack to make healthier pancakes, flap jacks, french toast, crepes and more. In addition the non-stick surface really means nothing ever sticks, including burnt cheese. Once you’re done cooking you can easily slide the food right out of the pan and there’s no messy cleanups. The Flip Jack features a unique dual hinged design which makes flipping a breeze. Now you no longer have to flip pancakes with a spatula and worry about breaking your pancakes. To use the Flip Jack Pan you first heat it up on the stove and then add in the pancake batter. The tight fit design of the pan helps keep the batter inside for less drips and messes. Next use the handles to close the lid and then flip the pan over. Open it up and you’ll have a flawless full sized flap jack, just like the ones you order from the restaurant. The Flip Jack Pan is one of the easiest ways to make flawless flap jacks every time. No other cookware lets you flip and slide so easily. The Flip Jack Pan sells for $19.99 plus the cost of shipping and handling. Plus right now there’s also a special offer for a getting a second Flip Jack Pan at a discount available. For just an additional $12.99 you can get a second Flip Jack Pan, a Flip Jack Recipe Guide, and a Batter Pitcher with your order.